When cardiac function is normal, the filling of the right and left ventricle during diastole is the predominant determinant of the stroke volume and cardiac output. Positive pressure ventilation increases intrathoracic pressure, which in turn reduces the venous return to the heart . In normo- and hypovolemic patients, this produces reduction in right- and left-ventricular filling and results in decreased stroke volume, cardiac output and oxygen delivery (DO2). To normalize systemic blood flow during mechanical ventilation, intravascular volume often needs to be increased and/or the cardiovascular system needs pharmacological support. Reducing mechanical ventilation to a level which provides adequate support for existing spontaneous breathing should help to reduce the cardiovascular side effects ofventilatory support . Periodic reduction of intrathoracic pressure resulting from maintained spontaneous breathing during mechanical ventilatory support promotes the venous return to the heart and right- and left-ventricular filling, thereby increasing cardiac output and DO2 . Experimental [27, 29, 37, 38] and clinical [24, 30, 36] studies show that during APRV/BiPAP with spontaneous breathing of 10 to 40 % of total Ve at unchanged Ve or airway pressure limits results in an increase in cardiac index (Fig. 5). Simultaneous rise in right ventricular end-diastolic volume during spontaneous breathing with APRV/BiPAP indicates improved venous return to the heart . In addition, the outflow from the right ventricle which depends mainly on the lung volume which is the major determinant of pulmonary vascular resistance may benefit from a decrease in intrathoracic pressure during APRV/BiPAP . In contrast, ventilatory support of each individual inspiration with PSV and identical airway pressures produces no increase or small increase in cardiac index . The increase in cardiac index observed during PSV when compared to controlled mechanical ventilation was a function of the pressure support level. 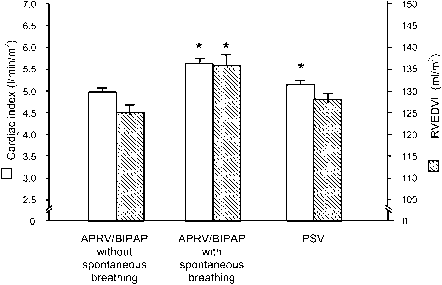 This indicates that during assisted inspiration with PSV, spontaneous respiratory activity may not decrease intrathoracic pressures sufficiently to counteract the cardiovascular depression of positive airway pressure. Rasanen et al. documented that a changeover from CPAP to spontaneous breathing with APRV/BiPAP did not affect cardiac output and tissue DO2. In contrast, a similar ventilatory support with controlled mechanical ventilation reduced the stroke volume and DO2. Patients with left-ventricular dysfunction may not benefit from augmentation of the venous return to the heart and increased left-ventricular afterload as a result of reduced intrathoracic pressure. Therefore, switching abruptly from controlled mechanical ventilation to PSV with simultaneous reduction in airway pressure can lead to decompensation of existing cardiac insufficiency . Rasanen et al. 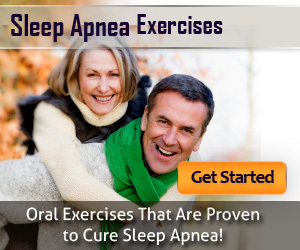 [41, 42] demonstrated the need of adequate ventilatory support and CPAP levels in patients with respiratory and cardiogenic failure. 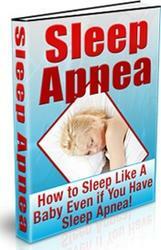 However, providing that spontaneous breathing receives adequate support and sufficient CPAP is applied, the maintenance of spontaneous breathing should not prove disadvantageous and, therefore, is not contraindicated even in patients with acute myocardial infarction or cardiac failure [41-44]. How does aprv increse right ventricular afterload? How aprv increased right ventricular afterload? Why is right ventricular filling reduced with positive pressure ventilation? How is ventilation linked to cardiovascular system?